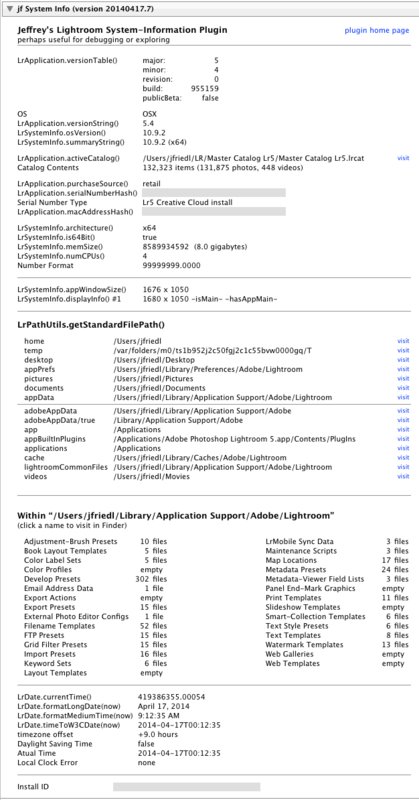 This Lightroom plugin shows (in the Plugin Manager) some data about Lightroom and the machine it is installed on. An example display is shown below. A plugin developer may ask a user to send a screenshot of the data as part of debugging an issue. It can also be used to check your system clock (by comparing it against the clock on my server), and to explore the various Lightroom preset folders. Note: as of version 20141019.22, on Windows systems the plugin checks for the POODLE security vulnerability, and if found, offers to fix your system. Added the ability to save a text snapshot of the displayed data. Removed the list of installed plugins, as it no longer seemed to work. Try to get around an issue on Windows. Added Lightroom's language to the report. Added the ability to calculate the size of your caches (standard previews, smart previews, Lightroom app cache, and system ACR cache). Also displays the size of the catalog. 20141019.22 Windows Systems: Detect whether Lightroom is vulnerable to the "POODLE" SSL 3 vulnerability, and offer to fix it if so. 20140814.20 Add a line for the Lightroom preferences file. List installed plugin IDs and paths. 20140704.14 Sigh, introduced an error for some folks with the rebuild the other day. 20140625.12 Fix a silly bug introduced in the previous build. 20140417.8 Fixed a crash that happens on some European systems. 20140417.7 Added the count of catalog items. Better Creative-Cloud support. System numeric format. Various cleanup. 20140204.4 Added info about the system's display sizes, and the application window size. 20130524.3 Apparently, a recent change broke things on Lr2, which some folks apparently still use. Hi Jeffrey. I’m hailing from Canada. I’m interested in trying my hand at writing a Lightroom plugin and thought you might be able to help me get started, or potentially stop me from wasting a lot of time. The idea I have in mind includes capturing new keyboard shortcuts do performing actions based on them. For example, capturing ctrl-alt-e and adjusting exposure. I know that it is possible to access many of the capabilities of Lightroom from Lua, but is it possible to capture keyboard presses and respond to them from a plugin? Beim Ausführen eines Skripts des Zusatzmoduls ist ein Fehler aufgetreten. Well, it seems you don’t really know your own Plugin? 😛 🙂 Because there is neither a part of “keep private” in your plugin, nor is there anywhere a part with the tag “keep private”. I checked System Information as well as your own plugin. In System Information it is not fully shown (last numbers are ****) and in your Plugin there is nothing except the Hash of the Serial. And no chance to copy it, as there is nothing to click on. To be honest the most confusing manual I have seen. I guess nobody would find this “keep private” thing. Dear Jeffrey, I’m writing from Germany. This plugin reports at field “OS” a value of “Windows” or “OSX”. How does the plugin detect this value? Up to now I couldn’t find a suitable way to determine this string. E.g. “LrSystemInfo:osVersion()” has different outputs at Windows and at OSX. A sample return value at Windows is “Windows 10”, the same call at OSX returns “10.11.3” (without “OS X”). There is the button ‘view plugin log’ which opens a text file with some information. Have you considered adding a save to text button to save the information as seen on the plugin screen?